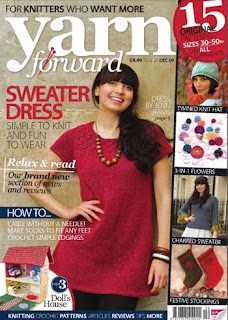 What do you do when you have a duplicate of a nice British magazine, issue #20, Yarn Forward (their website doesn't get updated much)? Well, holding a little blog contest seemed like a good idea to me. Since the prize is small, the contest is easy. Leave a comment, tell me what your main knitting project is (and a link, if you like) and you're entered! That's all there is to it. I really like this magazine, not only for the patterns but also for the articles. Maybe you'll enjoy it too. I'll draw a name at random next Sunday, September 12th. Good luck. My current knitting project (well, one of them) is Nova Scotia by Alice Starmore from the book Fisherman Knits. It can be found on Ravelry. Right now, I'm working on Bonne Marie Burns' Ribby Cardi. I'm replacing a cotton sweater that's gotten so ragged, I probably look like a bag lady when I wear it. I just find a cotton sweater to be so functional here in Colorado. I will miss the poor thing when I eventually toss it away. I don't have a main project right now, caps for newborns, children's caps for the local Christmas tree, always dishcloths for give away. Hopefully I plan to start a Wonderful Wallaby for my Great grandson. Currently I am doing my borders on my knit to fit cardigan I started in Cristi's class. When this is done on to a baby hat/bootie set for a friend due Oct 7th. DGS Sweater Vest and Alligator Scarf and DGD Bolero for Christmas gifts! I'm thinking the ho;liday is creeping up on me quickly! My main knitting project is socks. Lots of socks! And in between I have a cowl I'm working on. But it is hard not to start more projects that are on my "to do list" lol. My current project is part of our local KAL, knitting something with our own spun yarn. I am knitting "198 Yards of Heaven"by Christy Verity, and I am using a fantastic alpaca & silk mix. Love it! Great idea to get comments, by the way! I was working on Maia, but we moved and things were just so complicated in life that I couldn't deal with following a pattern. So, I started knitting a shawl of my own invention. Simple triangle with center and side increases and very simple stitch patterns. Current project is socks almost a fair isle Monstersock, using Wildfoote for main color then lots of bits of leftover Lorna's Laces for the patterns, so far so good. My current main project is a whole bunch of half finished favorite projects. Soon I should have something fininshed, then it will be my favorite! Right now I'm making some pumpkin hats for a friend who had triplets earlier this year, because there is nothing cuter at Halloween than little ones with pumpkin hats! There's a picture of what I'm working on at http://kitten-with-a-whiplash.blogspot.com/2010/08/kitten-with-wiplash.html I'm past splitting for the armholes now, but haven't taken an updated pic. THanks for the giveaway.